When the possibility of the fountain pen came about, the question the arose of what to make them from. Materials engineering in the 19th century was not quite what it is today, as the whole petrochemicals industry had not taken off yet. The choice was driven by convenience to the user (nothing jagged or given to splinters, for example, and at least an attempt at durability), convenience in manufacture, ability to contain ink, and relative availability. The winner, as it turned out, was rubber. We in the early 21st century tend to think of rubber as a floppy material, at its hardest in car tires and more usually in shoe soles and elastic bands. Well, that’s just a matter of how it’s manufactured– while the Victorian era may not have been all that we now are in materials engineering, they were not completely innocent of it, either. Hard rubber had most of the attributes come could hope for in a pen body, being smooth to the touch, resistant to ink (keeping in mind that the earliest pens were of the eyedropper sort), and easily machined. It is, to the modern eye, almost indistinguishable from plastic. The only drawback was a relative brittleness, but that was a problem which the user could address through being careful. Hard rubber for fountain pens actually came into use rather before Waterman’s coup, with the invention of vulcanization in 1844, and it saw use in some of the prehistoric monsters referred to in the previous section. Another notable feature of the early fountain pen was its colour. Hard rubber was predominantly black. While there’s nothing wrong with black, it is not extremely decorative, and we humans love our ostentation. 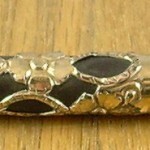 It may be argued that cap bands are merely there to prevent the cap from splitting, and that precious metal overlays are not much different from the silicone skin for slipped onto an iPod to protect it from wear, but they were also ways to introduce shiny metal decoration to the relatively bland blackness of the pen. A less costly means of sprucing up the appearance of the early pens was chasing, in which the body of the pen was passed through a machine which impressed a pleasing repetitive pattern into the rubber itself, a sort of steampunkish 3D copier; this effect can be seen in the pen on the banner above, and in most of the examples in this era’s mug book. One of the points of value in a chased hard rubber pen is how well the impressions have survived the decades. Those who pay close attention to this page will find the preceding paragraph has changed; I’ve been put right regarding the chasing process by someone who is a far better scholar than I, and happily accept the correction. Waterman’s Ripple. Parker’s “Big Red” Duofold is also of this era. As the dawn of fountain pens grew to an actual day, there was a certain amount of experimentation with other colours of rubber. Red was the primary alternative to appear, and Waterman was notable for “ripple” pens combining two colours into one pen. Since non-black rubbers were even more fragile than black, ripples, wood-grains and other decorative colour blends were also a form of reinforcement, in a manner similar to the pattern-welding of harder and softer iron alloys to make swords. Before jumping into the next exciting era of fountain pens, though, I should address fillers. While I mention eyedropper filling above, it should not be imagined that this was the only mode of filling throughout the Age of Rubber. Some bright spark remembered that rubber also comes in non-hard forms, and the use of a rubber sac became quite popular, with various means of compressing it to expel air and then take in ink. I find references to 1890 as the beginning of sacked pens, but the earliest hard date for a mechanism I’ve discovered is Conklin’s 1901 crescent-filler. A lot of these early variations relied on the resilience of the sac itself to return the mechanism to its starting position, which can somewhat compromise filling; later developments like the Sheaffer lever (pat. 1907, but not in production until 1912) and the Parker button-filler (pat. 1905, in production in 1913– can it be these makers were ensuring something worked properly before offering it for sale?) relied upon spring power, and remained in service long after most of the other early fillers had become mere curiosities. This initial burgeoning of the phylum of fountain pens culminated in a great change of material. Hard rubber, for all its advantages, also had limitations in durability and decoration which the next era sees addressed– the former somewhat and the latter in a very positive way, for it is the Colour Explosion. 1888 – George S. Parker establishes his company. 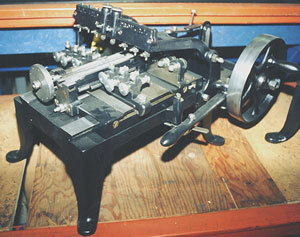 1894 – Parker introduces the “Lucky Curve” feed. 1899 – Heidelberger Federhalterfabrik is bought by Heinrich Koch and Rudolph Weber and (eventually) renamed Kaweco. 1901- L.E. Waterman dies, and the company is taken over by his nephew Frank D. Waterman; Conklin patents the crescent-filler. 1905- Conway-Stewart pens founded (by men named Garner and Jarvis). 1912- Sheaffer begins producing pens with their patented lever. 1913- Parker brings out button-filling pens. 1915 – Wahl begins production of the Eversharp Pencil. 1917 – Wahl buys the Boston Fountain Pen Company, producing pens under the “Tempoint” brand. 1921 – Parker introduces the Duofold, in red hard rubber; Wahl begins production of a line of metal-bodied pens. Gallery of pens of this era.